I feel like I've gotten a bit of a reputation as the kind of person who wouldn't know fun if it punched her in the face, but that's not how I see myself. I think I'm fun. Granted, I don't think I'm the kind of fun you get at amusement parks or children's birthday parties, but I am fun. Really. I'm fun. I can be fun. This is me being fun. Wheeee! Anyway, my point is, I know that I don't really come across as the sort who'd be good at discussing a children's media series that is literally all about the fun, but I'll have you know that I went to see Night at the Museum 3: Secret of the Tomb not because anyone forced me to go, but because I wanted to. I wanted the fun. So there. It's just that I then came away a little bit disappointed that the fun wasn't quite as substantial and full of good other stuff as I'd hoped. I think it's not that I'm not a fun person - the jury's still out on that, probably - but rather than I have high expectations of my fun. I want it to mean something. Something important and bigger than just sheer entertainment. And while I absolutely can't deny that Night at the Museum 3 was fun as all get out, it didn't have that extra layer of emotional complexity that would make it actually, you know, good. If you're not the sort to have followed the scintillating Night at the Museum series since its onset, here's a basic rundown. 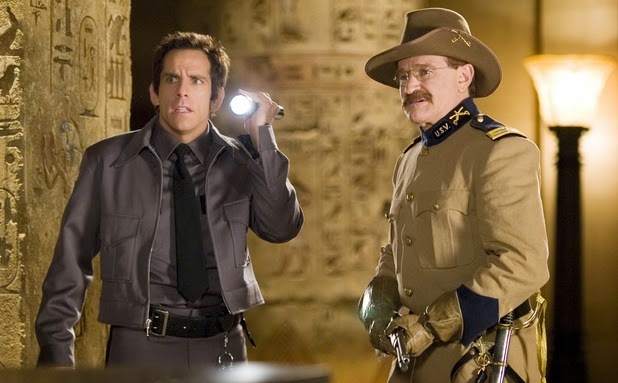 Larry Daley is a night security guard who discovers that the museum very literally comes alive at night. As in, due to a magic tablet, the exhibits become quite literally alive. Larry spends the first movie freaking out about this, and then slowly eases into tan acceptance of the weirdness. By the start of the third film, he's all in, and has managed to maneuver himself into being the director of the "Night Program" a "special effects" program that "brings the museum to life". Larry likes his life, and he's perfectly happy to keep doing this for the rest of his days, but fate, as always intervenes. On the night of a big gala for donors and fundraisers, the museum comes to life, but not like usual. This time everyone is mean and angry and confused and attacking all the guests. Which is very bad for Larry, whose job depends on keeping the museum in line. It turns out that the tablet that makes the whole museum magically come to life is deteriorating. It's got some kind of rot and it seems awfully likely that if it isn't fixed soon, the magic that makes the museum so special is going to end. Larry's not about to let that happen, not when his livelihood and also his closest friends depend on this magic. So he packs up the tablet and its owner, Ahkmenrah (Rami Malek), and ships them off to London with himself so that they can ask Ahk's father (Sir Ben Kingsley) how the tablet works. 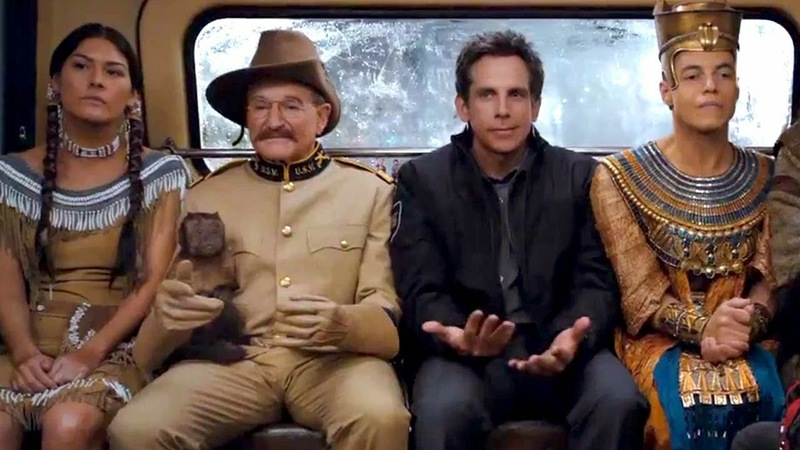 Of course everyone else gets themselves shipped out too: Teddy Roosevelt (Robin Williams), Sacajawea (Mizuo Peck), Jedediah and Octavius (Owen Wilson and Steve Coogan), Attila the Hun (Patrick Gallagher), and even the freaking monkey. Oh, also there's a new addition to the museum, a caveman who looks just like Larry and calls himself Laaa. Isn't that just ducky. 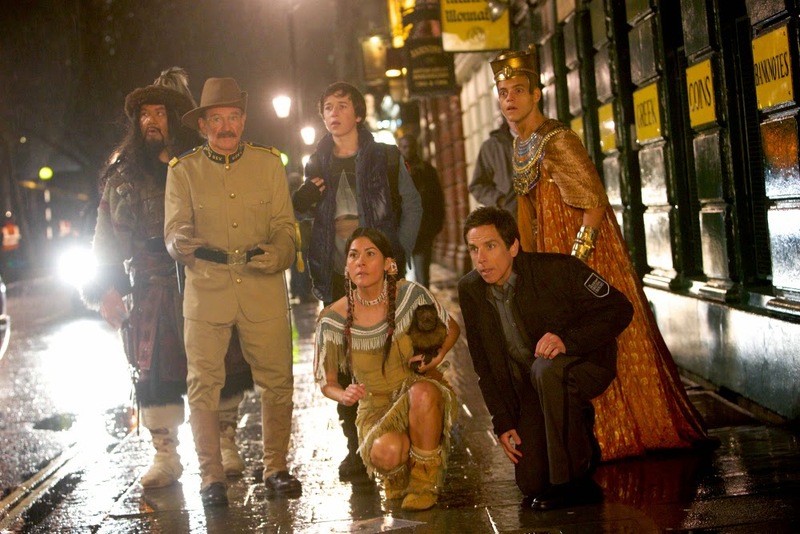 So everyone troops off to the British Museum, tricks their way past the guard, Tilly (played by Rebel Wilson in not one of her better roles), and sets off to find the Egyptian exhibit and fix the tablet. Obviously things don't go smoothly. And the rest of the film follows our gang of heroes as they desperately try to get through the museum in one piece while the magic from the tablet slowly wears off. There are heart-wrenching betrayals (not really), touching reunions (eh), and near death experiences galore (they get old). The bulk of the story is told in their attempts to get through the museum to Ahk's parents, but unfortunately that story is pretty tired and worn. 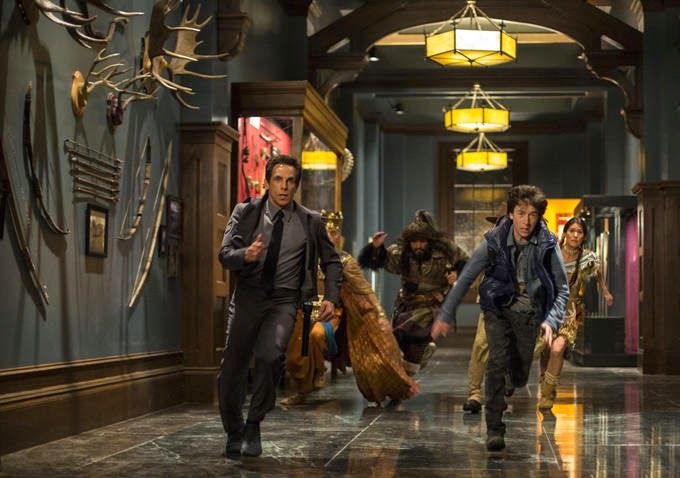 Larry has brought his son along with them for this trip, hoping that the magic of the museum will bring them back together and remind Nick (Skyler Gisondo) of how much he loves being a kid. It doesn't really work out for Larry, as Nick is mostly concerned with growing up and becoming his own man. He is, after all, seventeen, and wants to see the world and sow some oats before he settles down to an expected life. All of this drama and family tension, then, becomes the backdrop for our sprint against time. Ahk has to deal with his own parental issues, while Larry and Nick try to sort themselves out, and everyone worries that they won't make it. 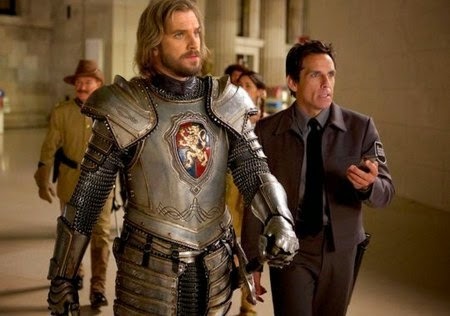 Also Lancelot shows up (Dan Stevens). So that's the story of the movie. In a nutshell or so. It seems perfectly innocuous and fun and nice, right? Well, yes. It is. I'll be the first to admit that it was very fun to watch. But fun isn't the same thing as good, and I refuse to believe that just because something is fun, it's allowed to be anything less than its best. You see, the big issue I have with this film is that it felt like everyone was just phoning it in. There is room in this story, silly as it is, for a real, epic, heart-wrenching series of events. But instead of really going for the emotional reality alongside the fun, we got a scene where a man kisses a monkey. Hmmph. The heart of the film is supposed to be Nick and Larry's relationship, but I honestly didn't care all that much about them. Nick annoyed me but Larry was clearly in the wrong, so it was hard to really get invested. Meanwhile, Ahkmenrah was preparing to reunite with his parents after several thousand years (I think - it was unclear whether or not they were together in the tomb), and it felt much more like his story should take center stage. The inclusion of Laaa felt pretty gratuitous to me, as I've never cared for cheap humor like that, and the whole bit with the monkey just grated on my nerves. But most of all what frustrated me was the way that the film denied all of these interesting characters the opportunity to actually feel something, to actually have a stake in their own destinies. At the end of the film the tablet has finally been fixed, and everyone is brought back to life, thank goodness. But the exhibits decide that the noble thing to do is to leave the tablet, and Ahk in London with his parents, because that's where it's supposed to be. They will all travel back to New York and, essentially, die and Ahk will be reunited with his family. It's all very touching and heartfelt, and it tells a story about reversing cultural appropriation and giving back artifacts that were stolen, etc. But it's also kind of annoying, because these characters are sentient beings and yet they all decide that the best thing possible for them is to die, and then they proceed to do so in a quiet, orderly fashion. There's no rush of emotion or strong feeling. Just a couple of healthy backslaps and hugs, and then everyone we've come to love in the series so far dies. It's not the ending itself that I object to, it's the way it was handled, because it feels very much like the rest of this movie. They give up so easily at the end, reminding Larry to let them go, because they're just museum exhibits after all, that it stands as an indictment of all of the rest of the film, which is about Larry desperately racing to fix the tablet so that he can save them. Their deaths are shown as tragic horrors until all of a sudden they're not? That's just annoying. It bothers me because it feels like the whole movie is telling me to take a chill pill. "It's a kids' movie, just relax," it seems to say. "It's just dumb fun, who cares if it doesn't make sense?" Me! I do! I care! I care a lot. Because just because something is a kids' movie is no excuse for it not to be good. Just because something is silly and fun gives it no license not to also aim for being interesting and thought-provoking. Let us feel the weight of Ahkmenrah's reunion with his parents. Let us spend some time thinking about how his tomb really was robbed and he might feel violated about that. Or, let's take a minute and think about the emotional realities of all of these characters dying. You told us Sacajawea and Teddy Roosevelt are a thing, well then show us them being sad to lose each other! Just in general, it felt like this movie was afraid of its own gravitas. It wanted to bring up some hard subjects, but when it came time to actually deal with them, it balked. It backed down, and it decided that it would rather be fun than good. And I refuse to accept that as a choice that must be made. Besides, I imagine you have pretty high standards these days for the handling of identical-looking characters. Meanwhile, Ahkmenrah was preparing to reunite with his parents after several thousand years (I think - it was unclear whether or not they were together in the tomb), and it felt much more like his story should take center stage. Just in general, it felt like this movie was afraid of its own gravitas. Maybe have Ahkmenrah and his family vow to find a way to duplicate the tablet and send the copy to Larry so the New York museum can be brought back to life. The very same stuff can happen, but without it being a permanent mass suicide. Just ridiculously high standards, yes. Yeah, that would have been a good fix. And it kind of bothered me how comfortable all of the main cast were to be deciding in favor of suicide for all of their friends who didn't get a say. I mean, it's a bit hinky, isn't it? All those other people back at the New York Museum who died and never knew why? Or who died thinking Larry would save them all? It's just very sad. And wouldn't the simpler solution be to bring Ahk's parents to New York? I mean, yes, not in museum politics terms, but this movie already suspended my disbelief in a lot of ways. We could have done with one more.